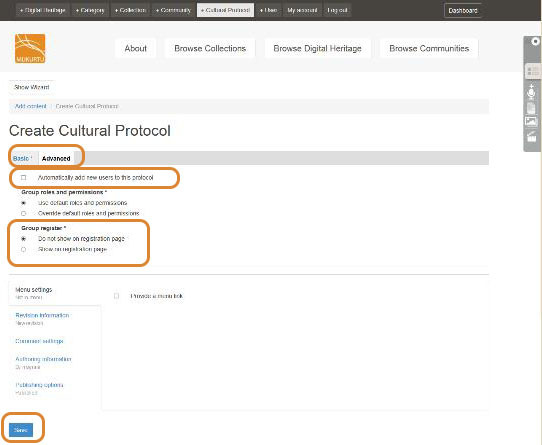 To create a new cultural protocol, either follow the +Cultural Protocol button from the navigation menu, or Create Cultural Protocol link from the Dashboard. Each Cultural Protocol must have a name. Best practice is to provide a name that is descriptive and unique - if a site has three cultural protocols named ‘Public Access’, that may be confusing for users. Select ‘Open’ or ‘Strict’ for the Sharing Protocol. 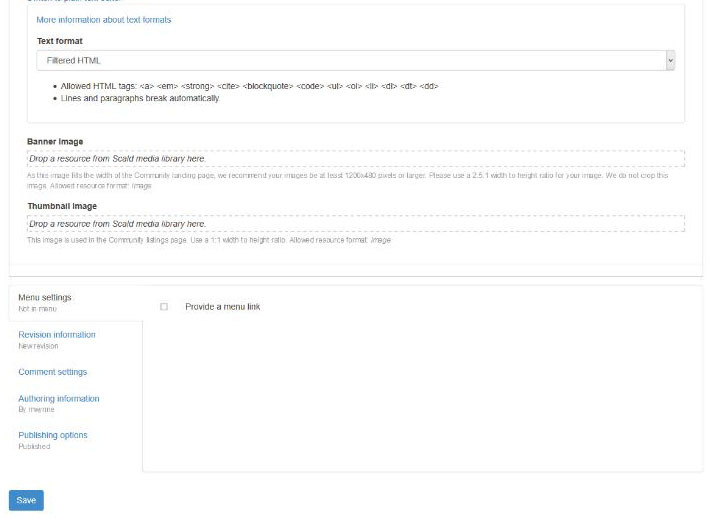 If a protocol is Open, any site visitor (even those without an account) can view content within that protocol. If a protocol is Strict, only users who are also members of that protocol can view content within it. Protocols are not standalone, they reside within communities. Select a community from the dropdown menu. Only communities in which the user is a protocol steward will be displayed at this step. Best practice is to provide a brief description, so that users can have some understanding of the purpose of the cultural protocol, its membership, and the content they can expect to find within. 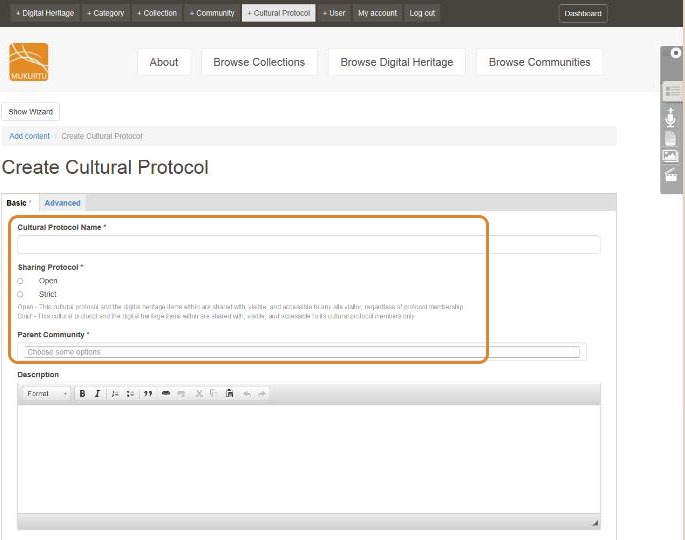 Cultural protocols can be customized with a banner and thumbnail image. On the Advanced tab are more controls for access and membership. A protocol can be set so that all new members are automatically added to it. This might be convenient if there is a general protocol which all users will need access to. This option is not enabled by default, to best manage privacy settings. When a user first registers for an account, they can request access to cultural protocols (requests are approved by protocol stewards). For a new site user to be able to request admission to the cultural protocol, select Show on registration page. This option is not selected by default. When done, click Save. 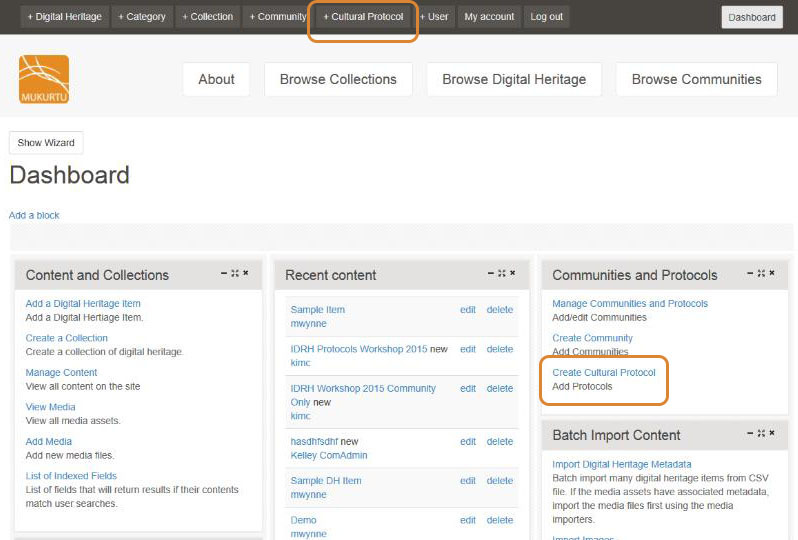 All fields can be edited or updated later by editing the cultural protocol. You will see a confirmation screen saying that the new Protocol has been created. You will also be added to the new protocol by default. After saving the cultural protocol, a confirmation message will be displayed. For more information about cultural protocols, read the support article What is a Cultural Protocol? For more information about creating cultural protocols, watch the video below. 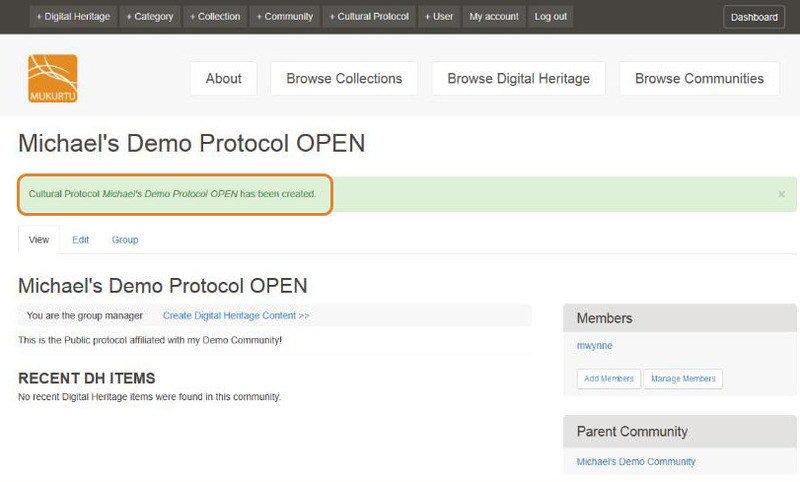 How to Create Cultural Protocols from mukurtu on Vimeo.